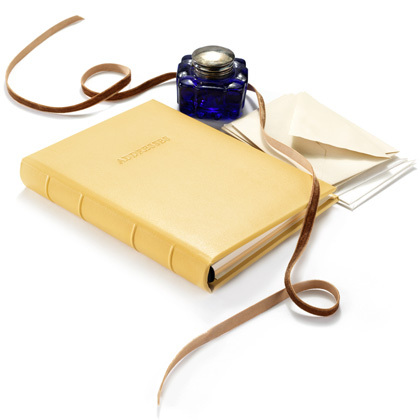 Our refillable Ring Bound Leather Desk Address book is crafted to the same exacting standards as our leather photo albums. The covers are wrapped with Spanish bonded leather and the ring metals are anchored to back plates embedded in the book’s spine. The alpha tabbed dividers are reinforced with mylar to prevent wear. To complement our Leather Desk Address Book we offer a Leather Pocket Address Book that shares the same format in a compact size with space for an impressive 403 records. Product colors may vary when viewed from one computer monitor to another. If you are in doubt about the color/grain you will receive, particularly if you are ordering personalized items, which are non-returnable, we recommend you order swatches of the color/grain you are considering before placing your order.